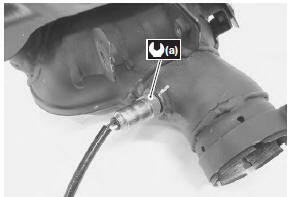 Loosen the muffler connecting bolts (1). 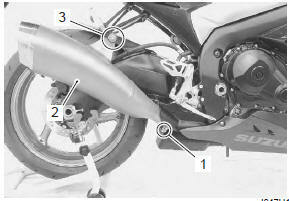 Remove the mufflers (2) by removing the mounting bolt and nut (3). support the muffler to prevent it from falling. 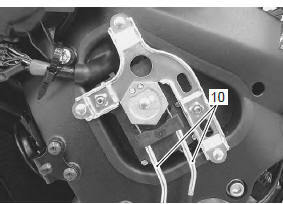 Lift and support the fuel tank with the prop stay. Refer to “fuel tank removal and installation” in section 1g . 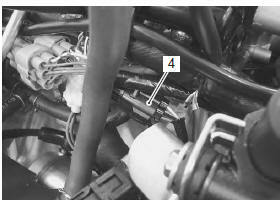 Disconnect the ho2 sensor coupler (4). Remove the muffler chamber heat guard no. 2 (5). 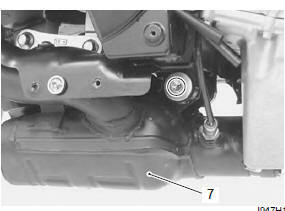 Loosen the muffler chamber connecting bolt (6). Remove the muffler chamber (7). Remove the muffler chamber heat guard no. 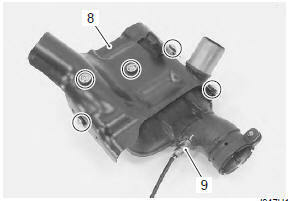 1 (8) And ho2 sensor (9) from the muffler chamber. be careful not to expose the ho2 sensor to an excessive shock. Be careful not to twist or damage the ho2 sensor lead wires. Remove the excv cables (10). Refer to “excv cable removal and installation” . Move the radiator and oil cooler forward. Refer to “radiator inspection and cleaning” in section 1f . 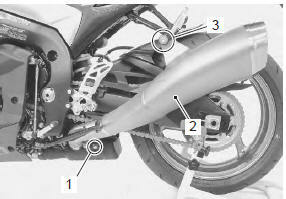 Remove the exhaust pipe assembly by removing the exhaust pipe bolts. take care not to bend the radiator/oil cooler fins. support the exhaust pipe assembly to prevent it from falling. 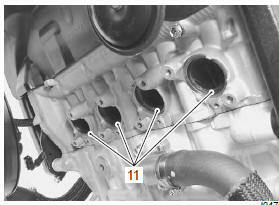 Remove the exhaust pipe gaskets (11). 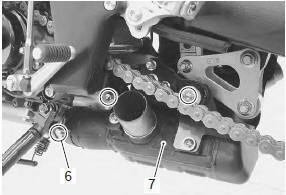 tighten the ho2 sensor to the specified torque. Do not use an impact wrench when installing the ho2 sensor. Do not apply oil or other materials to the sensor air holes. 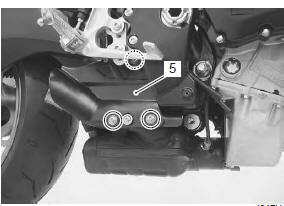 Install new gaskets and connectors and tighten each bolt to the specified torque. Refer to “exhaust system components” . replace the gaskets and connectors with new ones. when installing a new connector, remove all of the old sealer. Apply the exhaust gas sealer to both the inside and outside of the new connector. Install the excva cables. Refer to “excv cable removal and installation” .